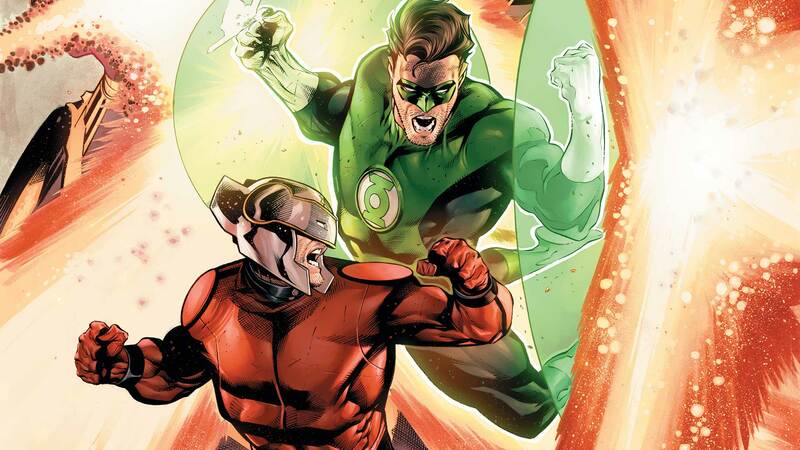 Brace yourselves kids, it’s time for another Green Lantern/New Gods crossover! While I wasn’t exactly positive when Green Lanterns crossed over with the New Gods, I’m always excited to see New Gods regardless. Namely because they’re a creation of Jack “King” Kirby, arguably one of the greatest minds who has ever worked in comic books. While I’m not exactly familiar with the workings of New Gods, they do catch my attention each time they show up. With this being Jack Kirby’s 100th birthday, a celebration is needed for the King of comics! Warning they’re will be spoilers, read your book before hand. You have been warned. If you’ve been following this site for some time, then you know I do my best to take into consideration how a new reader would react to most issues. Now I understand there is a contingent of veteran readers who feel that new readers should pick up any random pick and if that book is written well then any issue should be new reader friendly. That works in theory, but let’s face while we all remember jumping on a random issue number and instantly loving whatever comic we read. but chances are that’s only nostalgia. Hal Jordan & The Green Lantern Corps #26 serves as a perfect jumping on point for those looking to try Green Lantern for the first time. It doesn’t ignore the rupture between the two corps from the previous two issues, but it also doesn’t dwell on it either a perfect balance. You’ll get the general idea of what this book is, and the cliffhanger of Orion being struck by Omega Beams should be enough of a hook to keep new fans for the rest of the arc. You might be a shocked to read the following sentence, but I’m not the biggest fan of having all four Earth Green Lanterns in one room. I prefer to see them paired off. When they’re all in the same room, one or two of them tended to be drowned out by whoever is the loudest (namely it’s Guy). Seeing Guy and John have an earnest conversation reminds me as a Green Lantern fan of how deep their friendship goes, even though both of them are completely different they still have their backs, and their personalities still shine through. The same can be said between Kyle and Hal, two characters are the polar opposite of each other, poke fun at their differences but still trust one another. It also gives new readers a peak into their friendships without dumping loads of unneeded history. Personally it’s driving me crazy that I’m not seeing more people praise Rafa Sandoval’s art for the series. I do my best to champion his work each time he comes up in the rotation. His line work continues to remain gorgeous as ever, and while it’s not classic line work it has a wow factor that I can’t explain. Forgive me for my hyperbole for just a moment, but similar to when Van Sciver draws an issue, Sandoval makes the comic feel like a big deal. You combine this all with his excellent storytelling, you have pitch perfect artist for this series. While I’m extremely positive about this issue, at the end of the day it’s still mostly set up for what’s to come. All in all, really enjoyed it from start to finish. I’m personally looking forward to some New God action!